Publisher: CN Times Books Inc. The moral and social philosophy of Confucius is an intrinsic element of the Chinese national character. 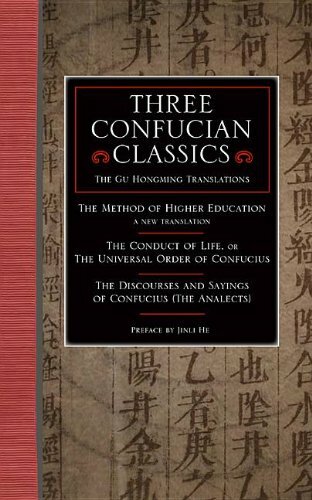 This volume contains three renowned works translated by Gu Hongming: The Method of Higher Education: A New Translation, The Conduct of Life or The Universal Order of Confucius, and The Discourses and Sayings of Confucius (The Analects). Hongming, a renowned scholar of Confucius, sought to help the West better understand China through these works. His original texts of Confucius’s thoughts are collected here, and through them, the reader will come to a better understanding of both ancient and modern China. Born in Malaysia in 1857 to a Chinese father and Portuguese mother, Gu Hongming’s mixed race family gave him an understanding of Asia and Europe that he would use well throughout his life. Educated in Scotland, he received an M.A. in Literature from the University of Edinburgh, a diploma in Civil Engineering at the University of Leipzig, Germany and studied law in Paris, France. Returning to Malaysia in 1880 he joined the colonial Singapore civil service and eventually went to China where he held many ranking positions in the Imperial government. Throughout his career he wrote many essays and books about Confucius, primarily in English. By the end of his life in 1928 he was renowned as an interpreter of China and the Chinese people to the West. Dr. Jinli He, Ph.D. is Assistant Professor, Modern Languages and Literatures, at Trinity University in San Antonio, Texas, USA. She received her Ph.D. from the Department of Chinese Language and Literature at Peking University, China.